Glossier is the hip, pink, millennial makeup and skincare brand with a focus on healthy glowy skin and packaging from heaven. Their product range spans lightweight skin tints and concealers, eyebrow gels, cream blushes, moisturisers, lip balms, serums and more at a mid-range price point. With a philosophy of embracing natural beauty, enhancing not covering up and having fun. A year ago, in December 2017, I was lucky enough to visit the Glossier Showroom in New York. This is an absolute must visit for any beauty fanatics like me, located on the top floor of a building in SoHo, which of course you have to queue for, you are escorted up a private lift and into a pink heaven, then free to swatch and try all their products. 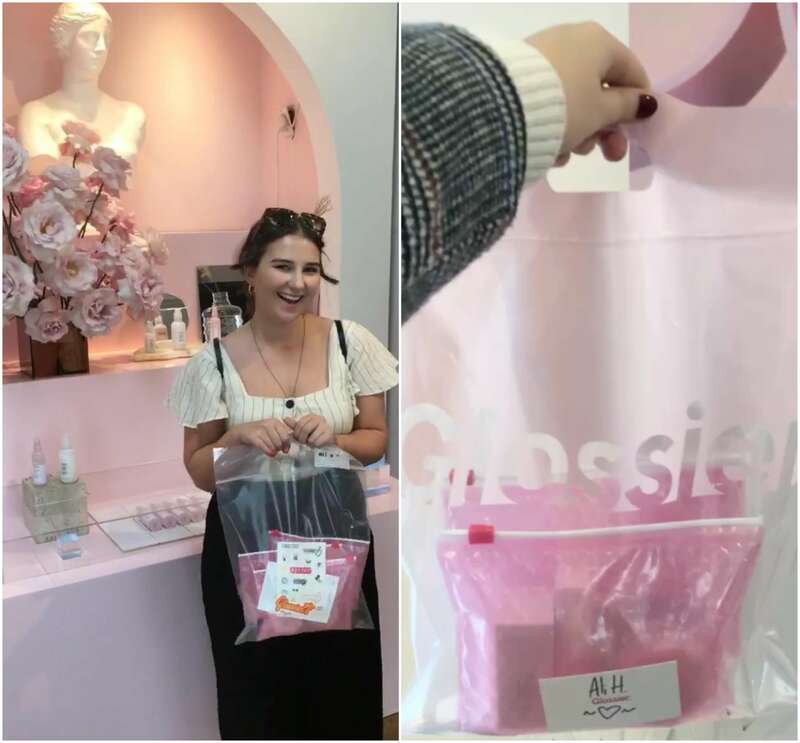 I picked up some of Glossier’s most popular products on that first visit to the showroom (they now ship to Ireland) and have been using them for a year now. Using these products has made me rethink how I see my skin and how I use beauty products. As a teen, I had very bad skin, which I struggled with and covered with heavy makeup and as I entered my twenties and my skin began to clear up I hadn’t changed how or why I used beauty products, I still believed covering up was the key. However, once I started trying out my purchases from Glossier and after much trial and error, something changed. I began to embrace Glossiers philosophy of enhancing and caring for your skin. I ditched the heavy foundations and powders, started focusing more on skincare and found myself enjoying the processes of doing my makeup and skincare routines more and more. Which is why I think Glossier is not only a fun brand with beautiful branding for millennials but one with quality products and a positive philosophy. This chemical exfoliating skin perfector changes your skin. I noticed a real difference after a few uses. Use it before your serums and moisturisers at night and you’ll wake up with noticeably clearer, brighter skin. It is a strong product that could dry out your skin so make sure to use a good moisturiser (and serum if you need it). But when used with their Bounce Serum, for example, it can really change the appearance of your skin to looking healthy and so glowy. Making everything else work better, your moisturiser will soak in better and your make up will apply much smoother. This is such a versatile product. It’s lightweight and hydrating so you can use it to conceal certain points around the face or all over almost as a tinted moisturiser. This concealer lets your skin shine through while evening out your skin tone and makes your skin look healthy and glowy. It has enough coverage to conceal any imperfections but leaves the skin looking natural and not at all cakey. As a huge lipstick fan (and hoarder) I have high standards for my lipsticks. I love a matte lipstick but hate when I can feel them on my lips. This is why Generation G is perfect, they call the finish a ‘blotted matte’ finish. With one application the lipstick looks kind of worn in, which may sound weird, but is amazing. It’s buildable and the colours range from natural pinks and nudes to vibrant reds and fuchsias. For the days where you just want an easy, low maintenance lip that still packs a great colour this lipstick is perfect. The shade Cake is always in any bag or pocket, just in case. This mask is a miracle worker. When your skin is looking dull or tired or if you just feel like you could use a bit more hydration, this mask is perfect. I use this slightly different to other masks (that I leave on for a while and then wash off) I put a generous layer over my face an hour or so before bed, most of it will of soaked in by the time you’re going to sleep, but then sleep with a remaining mask on. When I wake up, my face looks like a new face. All my late nights have been erased and my skin looks and feels fresh and healthy. My number one pick is a bit of a cheat, as it is two products. However, I think the combination of their two moisturisers is the best. The light Priming Moisturiser is perfect for the morning and will keep your skin hydrated throughout the day but not oily. It isn’t at all greasy feeling, which I feel like can happen with lightweight moisturisers. It soaks in really quickly and it the perfect no-frills moisturiser. It also sits really well under makeup. And the Rich is so luxurious and amazing for the night time. It feels expensive and smells amazing. It’s thick but doesn’t take any working into the skin and soaks in quickly. It’ll make your skin so soft with a natural glow in the morning.